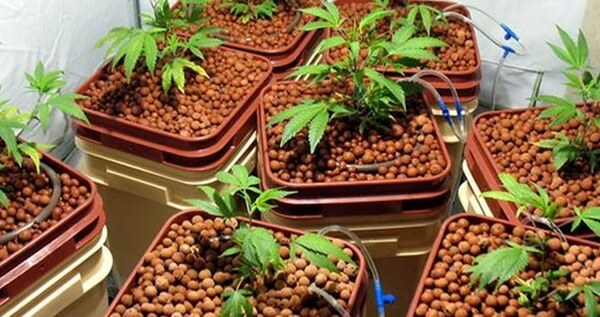 Hydroponics systems for marijuana growers have been around for a long time. Over time, numerous kinds of systems have evolved, allowing you to choose the perfect hydro system for your own lifestyle and growing preferences. Regardless of which type of hydroponics system you decide to use, you will need to have a complete understanding of the nutrients involved in order to have a successful harvest. The type and distribution of these nutrients is different from what you would need when growing in soil. Even if you have grown marijuana in soil before, you should read this guide so that you know what you will need to do differently. There are many different hydro system, each with it’s own advantages and disadvantages. The more advanced the growing technique is (like Aeroponics) the higher the possible yield. Here we’ll cover some of the details that make different systems distinctive from one another, as well as the types of nutrients you will need to provide your plants in any hydroponics system. Hydroponics will offer you the highest potential yield out of any method. 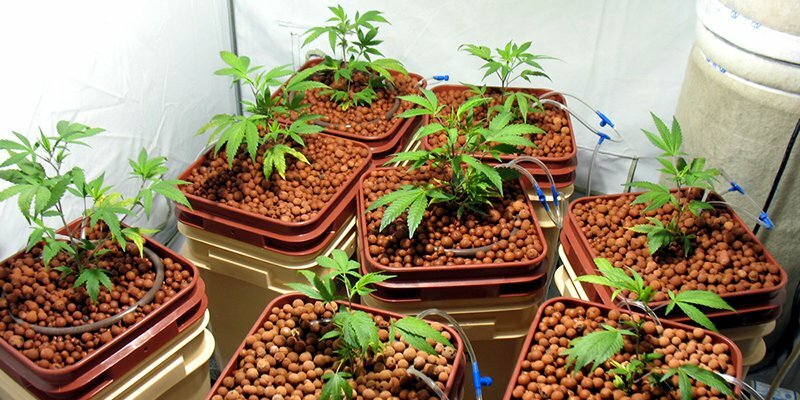 You maximize a marijuana plant’s growth by growing in water. Although it might sound a bit strange for a plant to grow without soil, there are actually plenty of examples of plants that grow wild in the water. One of the advantages of a hydroponics system is that it’s much easier to control the addition of various nutrients. You’ll only require enough substrate to allow the plant to remain upright. Because of the open nature of the root system in hydroponics, nutrients and oxygen also circulate easily, which further improves the efficiency of the plant. In reality, this means that certain aspects of hydroponics cultivation are easier than growing a plant in soil. It’s easier to check on nutrient levels and the hydration of the plant too. Soil has some advantages, but the yield isn’t one of them, especially if you’re an indoor grower. Hydroponics offers the highest potential yields when the process is followed properly. For a lot of growers, especially professionals, that is the be-all and end-all. That makes the decision. In addition to that high yield, Cannabis grows fastest in a hydroponics system. Plus, it’s much easier to keep the environment clean and clear of parasites, insects, bacteria, or other pests. The biggest downside is cost. Initial investment costs for hydroponics systems can be extremely high. The silver lining is that your quick turnover and high potential yields should balance out quickly over time. You also have to spend extra on auxiliary equipment: you need to be able to measure and analyze the EH, pH, and other environmental factors if you want any degree of success. When you use a hydroponics system to grow your plants, you won’t require any soil. Instead, you’ll use another form of substrate— some sort of material which has the ability to retain water and minerals, as well as allow a root system to take hold. Some of the more commonly used materials include vermiculite, coconut fiber, clay pellets, perlite, and rockwool. Below we’ll talk a little bit about your different options when it comes to substrate. For complete plug & play hydroponic grow systems, check this link. Rockwool is a light-weight and cheap mineral which does an excellent job of retaining water. It’s made up of basalt and a silica compound. You can purchase it shredded up, as a small block, or in large 1-meter plaques. You don’t need to water rockwool very much because of how well it retains moisture. Because of this, it’s important to keep tabs on how much water your plant is getting. Too much water and you risk fungus and a lack of oxygen in the roots. Because of its affordability and efficiency, rockwool is commonly used by professionals for Cannabis cultivation. Take note, however that it does have issues, especially for amateurs or those who aren’t experienced in using the material. Be careful not to use ‘isolation’ rockwool. This type can often contain chemicals that you absolutely do not want anywhere near your plant. Make sure you are using rockwool that is meant for growing and cultivating plants, as it’s a fairly versatile product. Also be careful about dry rockwool. It can irritate the skin and disintegrate into tiny pieces which can destroy the lungs. Make sure you are using some sort of breathing filter if you are working with dry rockwool. When properly moistened, this is less of an issue. Rockwool is naturally alkaline and growers need to be sure that they neutralize it in a solution of pH 4-5 before using it as a substrate for their plants. The neutralization process can take up to a full day. Because of rockwool’s excellent retention, you need to make sure it is getting fresh water and not building up too many minerals and impurities. Above all, don’t use a platter with rockwool, and definitely don’t reuse the water. This will help you prevent mold or fungal growth. Clay pellets are probably the simplest of the substrate options, even for new or inexperienced marijuana growers. They are exactly what they sound like – tiny little spheres of clay. Clay pellets don’t retain a great deal of water, so they’re very easy for growers to cycle water and nutrients through without worrying too much about drowning plants. The gaps between spheres are excellent channels for oxygen and nutrients to travel through, and roots prosper as a result. Not only that, but clay pellets can be cleaned and reused ad infinitum, making them a fine choice for those looking to keep a healthy bank account. In terms of water retention, coco is not dissimiliar from rockwool. It holds a lot of water. On the other hand, it can be reused, and you don’t need to worry about it causing any damage to your lungs or skin. It’s sold in similar sizes and portions as rockwool. Again, make sure you aren’t using a platter underneath your plant and don’t reuse already drained water. As with all substrates, water gradually to avoid any risk of drowning or nutrient burn to your cannabis plant. Read more about Coco Coir here! Perlite is a special type of igneous amorphic stone used in agriculture, horticulture and botany as a soil amendment and also as a standalone medium for hydroponics and cuttings in early stages of growth. It resembles crumbling white pebbles. Perlite is an excellent hydroponics substrate because it is highly permeable, but doesn’t retain a lot of water. This means it will help prevent compaction and allow nutrients and water to circulate easily, which is a vital part of healthy plant growth. Many growers add it as an additive to other substrates. Like rockwool, you’ll want to be careful when working with perlite since the tiny dust particles are dangerous to your lungs if you inhale them. The main disadvantage to vermiculite is that after a long period of use, it will disintegrate and fall apart, so it needs to be mixed with other substrates for an ideal growing medium. It’s commonly used in soil in ratios from between 1:5 to 1:10. A passive system usually just consists of a pot or container filled with some sort of substrate, either sitting in a nutrient solution or being watered by hand. Gauze is an extremely common substrate choice in passive systems. A pot is filled with substrate, and then strips of nylon gauze are laid in it. All of this helps the container to retain nutrient solution and then drain it and distribute it to the root systems of the plants. Static hydroponics are a great choice for growers looking at saving money in their grow operation. Of course, it does have disadvantages. The roots of your cannabis plant can be damaged most easily in a static hydroponics system since the water doesn’t circulate well on its own. Open circuit hydroponics systems are very powerful and quick, but also carry a commensurate cost. These sorts of hydroponics systems require heavy fertilization, and so they also create a lot of waste. Open circuit systems are used primarily by professional or large-scale growers. Usually, growers use coconut fiber and rockwool as substrates for open circuit systems. These types of substrates have a low permeability. They hold a lot of minerals and nutrients, so a high volume of water is required to circulate through the substrate in order to flush them out regularly. The high water retention as well as the large amount of water that needs to be cycled through the substrate are the primary reason it’s advised that amateur growers steer clear of open circuit systems. They need to be watered in meticulously measured cycles, and there isn’t a lot of room for error. The schedule and volume you need to follow when watering your substrate is dependent on the size of your Cannabis plant, the temperatures, the humidity, the levels of carbon dioxide in the environment and the substrate medium you’re using. Your roots systems will grow around pieces of substrate while an irrigation system waters the roots. Make sure any irrigation systems are properly synchronized so that you don’t end up with differences in how much water is being fed to different plants or roots. Irrigation pipes need to be installed at a slope so that water will be even distributed between plants. This is because water will flow out as quickly as it can, and plants at the end of a pipe get less water if there isn’t a tilt in the pipe itself. The process of finding the right angle at which you should be tilting your pipes is a complex one. If the process of trial and error in pipe angles is becoming overwhelming, growers can also utilize a device that will adjust the pressure at each individual dripper. Installing this sort of device will make it much simpler to evenly distribute the nutrient solution. Keep in mind that this sort of device will also require a pump at the beginning of the irrigation system to create high pressure to begin with, otherwise the water won’t move anywhere. Again, this open circuit system isn’t advised for amateur or hobbyist growers. It’s a lot of work, and there is a lot of room for error. The principles governing Cannabis cultivation in closed circuit hydroponics systems are fairly similar. Plants are irrigated with a nutrient solution, which circulates through the roots and is then gathered in a trough. This method causes significantly less waste than an open circuit system. Usually, closed circuit hydroponics systems use Perlite or clay pellets as the most common substrates. This is a great cultivation system for growers who don’t want to waste a lot of nutrients, being simultaneously economically and ecologically sound. The ebb and flood system is another option for hydroponics enthusiasts. The ebb and flood system functions with simple parts. To do it, you’ll need a table at least 10cm deep, a nutrient solution reservoir, a pump, and a sheet of opaque plastic to protect the roots from light. You just temporarily flood the root systems of your plant with nutrient solution, then let it drain back into the reservoir. Most growers have all of this attached to an automated system which floods the roots at regular intervals. You’ll also want to make sure you have an overflow pipe set up in case something gets clogged. Your pump will fill up the table with a nutrient solution until it reaches the overflow level, then it will drain back out after giving the roots enough time to absorb it. The most complicated part of this system is figuring out how long to wait between flooding and draining. The nutrient film technique is a type of active hydroponic system where a solution of nutrients is drained onto a tray to create a shallow high-surface-area film that flows along through the roots of the plants. This solution provides the plants with everything they need to grow and thrive. The roots will grow down into the tray and form a mat, taking advantage of the high surface area to maximize efficiency. Abundant and constant availability of water and nutrients means huge yields, as long as the grower is careful to also provide plenty of oxygen and light as needed for the plant. It is one of the most common hydroponic system used today by commercial growers. As for home growers, there is one system, in particular, which has stood the test of time, the Gro-Tank. The nutrient film technique was one of the first active hydroponics systems created specifically to meet the needs of growers operating out of their home. It was developed in the UK in the late 1970s and is still in use today. Assembly and operation are extremely simple, and the whole setup is very compact. This means growers with limited space will still have plenty of room for lights and fans and all of the other space-gobbling accessories they might need to make their cultivation operation a success. From an organizational standpoint, it also works well— the water reservoir is located below the system itself, so there’s less danger of leakage from pressure differentials. A different type of nutrient film technique involves a solution that is circulated through clay pellets inside of a pot that has small holes in its bottom. The solution flows out of the holes and back into the system, creating a closed loop. This setup requires a small pneumatic pump and is preferred over a traditional NFT because the uneven texture of the clay pellets force oxygen into the water. It also is an improvement over the old version because the clay pellets enlarge the surface area and help retain water more effectively. This way, if the pumps stop working, the marijuana plants are more likely to survive. Aeroponics make a very impressive cultivation system. This particular method functions without substrate and grows plants by suspending roots in the air and misting them periodically with nutrient solution. A tray separates the root system from the upper part of the plant. The aeroponics method lets roots absorb massive quantities of nutrients and minerals, and the plant can grow extremely quickly, producing gargantuan yields. Remember that this is likely one of the most complicated methods of growing, and you’re better off gaining experience with some of the simpler methods before moving onto aeroponics. The roots are very vulnerable in this system because they are bare. If the pump stops, plants can die extremely quickly since there is no water retention at all. Nutrients are the foundation of all plant growth, and certainly they are one of the most important elements in successful Cannabis cultivation. In a hydroponics system, plants get all the nutrients they need from water. If you decide to buy fertilizer, make sure it’s suited to use in a hydroponics system and that it has all of the necessary ingredients. Chelate fertilizers are the ideal choice, they are most reliably absorbed. Many growers advise using a mix of different fertilizers, or even better, mixing your own fertilizer that contains just what your plants needs to reach their optimum growth. After you’ve made a nutrient solution, you’ll want to carefully check the concentration of the fertilizer regularly since the different levels of nutrients have a tendency to fluctuate. The pH scale ranges from 0-14, with zero being the most acidic (positively charged) and fourteen being the most basic/alkaline (negatively charged). 7 is neutral. 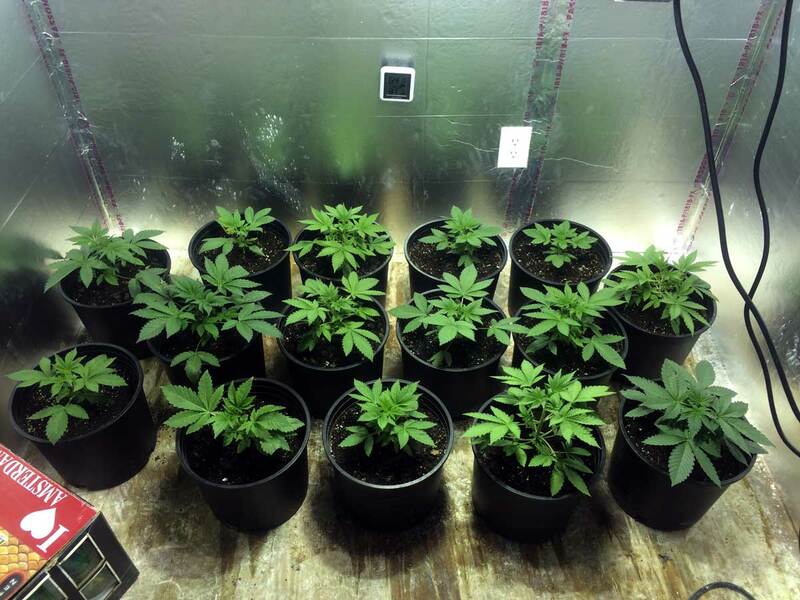 You’ll want the environment your marijuana plant is growing in to be stable at between 5-6, depending on the phase of growth it’s going through. Check in regularly: it can be difficult to monitor pH levels since each element of a nutrient solution has a different pH and the mixture might not be 100% homogenous. A cannabis plant that’s been grown in a hydroponics system absorbs nutrients most efficiently if the pH value of the solution is very close to 5.2. If the pH changes too drastically from this level, your plant can experience a wide array of issues, and may stop growing entirely. Checking pH levels is fairly simple. You can either use an electronic or chemical method of testing. Electronic testing is accurate but tends to be significantly more expensive. If you have a large growing operation, you’re probably going to want the electronic tester. If you haven’t invested too much into your hydroponics system and you don’t feel like measuring too often, you’ll be fine with the chemical test. If your pH rises too high, you can add some acid to balance it out, and tap water should correct a low pH. Ideally, you want to mix alimentary and phosphoric acid, which works well for both growth and flowering periods of your plant. When you measure the pH level of your environment, you are measuring the electrical charge, that is, the ratio of positive or negative ions present. In much the same way, you can also measure the electric conductance, which tells you about the amount of minerals present in the solution you are measuring. Obviously the presence of these minerals is very important. Water is an excellent conductor of electricity in part because of the minerals it contains. The more fertilizers, nutrients, or minerals added to water, the better a conductor it will become. Just as with the pH, your best bet for measuring electric conductance is an electronic device. The same is true for many other statistics, such as total dissolved solids (TDS), conductivity factor (CF) and parts per million of specific elements (ppm). When your Cannabis plant is in its initial growth period, it will require a solution with an EC measuring 0.8-1.0, while during flowering the EC should be somewhere between 1.2-2. If your EC levels rise too high in an active closed circuit system, it probably means that your plants are absorbing too much water, and not absorbing the nutrients. You can lower EC by adding additional water. If EC levels drop too low, it probably means you need to add more nutrients. Be careful to keep a close eye on all of these measurements, because it determines the overall health and productivity of your plant. Small shifts are unavoidable and normal, but you don’t want the fluctuations to be too large, or for levels to hover too low or high for too long. That will always negatively influence the health of your plant. If you don’t intend to check the levels regularly, make sure you regularly refresh your nutrient solution so you can at least approximate the right levels for what your plant needs. By Stop Algae On Marijuana Plants Now! Hey Jay, Can u please contact our customer service at [email protected], they can help you out! I'm from st Lucia can't get hold of some good seeds.im concerned about them arriving safely through mail?? Hi Loon, we do ship to st Lucia, check out our shipping policy http://shop.ilovegrowingmarijuana.com/pages/shipping-questions. If you have any questions, please contact support. Hi Bob, our White Widow is a good plant to grow and they come in both feminized and autoflowering-feminized. Have you checked out Robert's Grow Bible or his full course? In the video with the 9 pot grow system, what is the octopus and bucket device in the center of the grow? RayK, That would be the reservoir. How do you feel about the BC Northern Lights system? Do you feel as though this is a good system to grow plants? do you sell beginners grow kits with fertiliser ect for hydroponics?